$5,000 MutualOne Bank Checking for Charity award benefits Downtown Framingham, Inc.
Steven M. Sousa, executive vice president and chief operating officer of MutualOne Bank, has announced a $5,000 donation to Downtown Framingham, Inc. The award was made at the conclusion of the Bank’s 2018 Checking for Charity initiative, which promised a $10 donation to be shared equally by Downtown Framingham, Inc. and the Natick Center Cultural District for every new personal or business checking account opened during the year. “Through the business development manager, Downtown Framingham, Inc. provides free individual business consultations, facilitates the City of Framingham’s sign and façade subsidy program, and encourages participation in business-based events. The manager also interviews businesses routinely on policy matters affecting downtown, ensuring their voice is heard on issues,” Thraen stated. Downtown Framingham Inc. employees and representatives from MutualOne Bank gathered to celebrate the Bank’s donation (l-r): Yasmine Ouweijan, AVP and manager of MutualOne Bank’s Concord Street office; Courtney Thraen, executive director at Downtown Framingham, Inc.; Robert Mitchell, business development manager at Downtown Framingham, Inc.; and Yves Munyankindi retail support & foundation administrator at MutualOne Bank. MutualOne Bank’s annual Checking for Charity initiative will benefit two local community-building nonprofit organizations: Downtown Framingham, Inc. and the Natick Center Cultural District. According to Steven M. Sousa, executive vice president and chief operating officer, MutualOne Bank will donate $10 for each new personal or business checking account opened during the Checking for Charity promotion. The funds will be shared equally by the two designated organizations. Downtown Framingham, Inc. is an independent group dedicated to serving the people and businesses of the City’s downtown environment by actively promoting business, community, and culture. The Natick Center Cultural District, endorsed by the Massachusetts Cultural Council, promotes an active and dynamic arts and cultural presence and a vibrant, contemporary fusion of art, culture and business in a classic New England town setting. Steven M. Sousa, executive vice president and chief operating officer of MutualOne Bank, has announced a $9,350 donation to A Place To Turn. The award was made at the conclusion of the Bank’s 2017 Checking for Charity initiative, which promised a $10 donation to a designated local charity with each opening of a new personal or business checking account. Located in Natick, A Place To Turn helps meet the basic food and clothing needs of low-income MetroWest families and individuals referred by a network of social service agencies, health care providers, schools, and clergy. Since its introduction in 2008, Checking for Charity has benefited the Framingham History Center, Natick Historical Society, Framingham High School, Natick High School, Natick Veterans Relief Fund, Buddy Dog Humane Society, Framingham Public Library, Morse Institute Library, Callahan Senior Center, Natick Community-Senior Center, Ovations for a Cure, and the American Cancer Society. 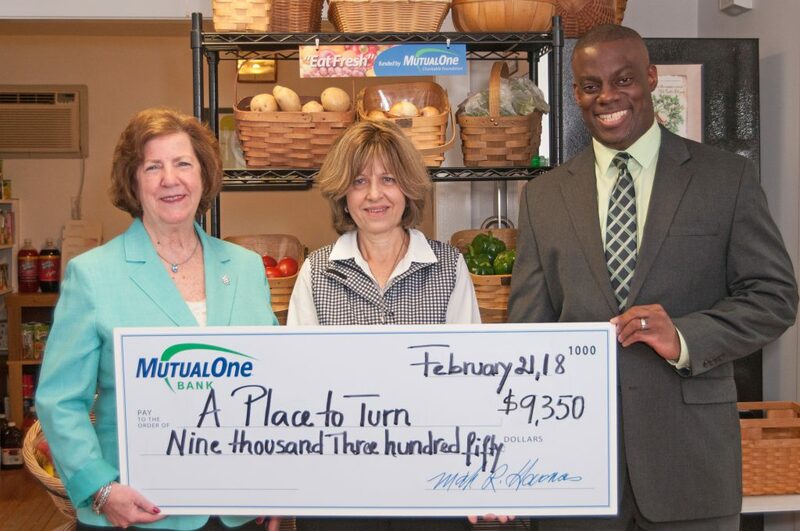 Donna Low (center), assistant director of A Place To Turn, celebrates the food pantry’s recent $9,350 Checking for Charity donation with MutualOne Bank representatives Nancy Devine, vice president, and Mobolaji Omisore, Natick branch manager. Steven M. Sousa, executive vice president and chief operating officer of MutualOne Bank, announced today that the Bank’s Checking for Charity initiative in 2017 will benefit A Place To Turn food pantry. Each year, through our Checking for Charity promotion, MutualOne donates $10 to a designated local charity with the opening of each new personal or business checking account. Since its introduction in 2008, the MutualOne Bank Checking for Charity promotion has benefited Framingham Main Library, Morse Institute Library, Framingham High School, Natick High School, the Natick Veterans Relief Fund, Buddy Dog Humane Society, Ovations for a Cure, and the American Cancer Society. Steven M. Sousa, executive vice president and chief operating officer of MutualOne Bank, announced today that the Bank has awarded $4,200 to benefit the Natick Historical Society. The award was made at the conclusion of the Bank’s most recent Checking for Charity initiative, which promised a $10 donation to be shared equally by the Natick Historical Society and the Framingham History Center for every new personal or business checking account opened during the promotion. Shown holding the ceremonial check for MutualOne Bank’s donation to the Natick Historical Society are (l/r) Aaron M. Dougherty, executive director of Natick Historical Society and Mobolaji Omisore, MutualOne Bank’s Natick branch manager.